I am speaking tonight at the Ontario Science Centre at the Royal Astronomical Society of Canada - Toronto Centre meeting. During this Recreational Astronomy Night gathering, I will be one of a handful of presenters. 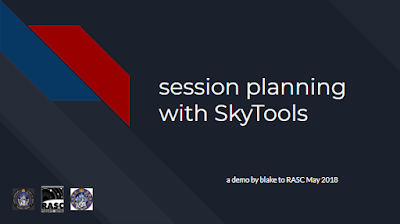 I will be talking about observing (or imaging) session preparation using the SkyTools software. This will also give me an opportunity to relay to members the (relatively) new benefit or perk, the very good discount pricing for RASC members. If you can't attend in person, be sure to jump into the live stream on our YouTube channel.